What is the Back to Work Program? How Do I Qualify? What is the Back to Work Program? 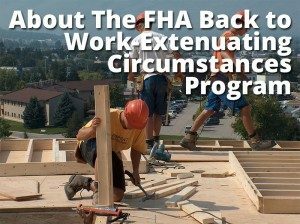 The Federal Housing Administration sponsored “Back to Work – Extenuating Circumstances” program is a mortgage loan counseling program designed to shorten the waiting time to buy a home for a potential borrower following a financial hardship. 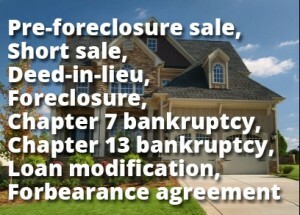 According to HUD, if you have had a foreclosure, short sale, deed-in-lieu of foreclosure, or have declared bankruptcy you may qualify for a new home loan if you are back to work and can document the extenuating circumstances. The program waives the traditional 3-year waiting period after a foreclosure, short sale, or deed-in-lieu to apply for an FHA loan, eligible participants can buy a home in as little as one year. This program can be used for both first-time home buyers and repeat home buyers. Mortgage rates remain the same as any other FHA loan. There is no premium on your interest rate and no additional fees at closing. The Back to Work Program does not affect your mortgage rate. The program is not limited by loan size. The FHA will insure up to your county’s FHA loan limit. Minimum Credit scores are required, a score below 580 is not currently allowed, which is a standard FHA mortgage guideline, but borrowers with no credit score whatsoever are still eligible. You are also still eligible for the program if you are currently unemployed. The program has ended as of September 30, 2016. How Do I Qualify for the Back to Work Program? To qualify, you must previously have experienced an “economic event” such as a pre-foreclosure sale, short sale, deed-in-lieu, foreclosure, Chapter 7 bankruptcy, Chapter 13 bankruptcy, loan modification, or forbearance agreement. Then you must demonstrate that you have fully recovered from that economic event. You also have to agree to complete housing counseling before closing. Lastly, you must be able to show your household income dropped 20 percent or more for a period of at least 6 months, which coincided with the economic event. The 20 percent income loss applies to everyone in the household. If one member of the household lost income as the result of a job less but the household income did not fall by 20 percent or more, the borrower will not be eligible. The 20 percent loss of income can be demonstrated through federal tax returns, W-2s, pay stubs, or unemployment income receipts. To demonstrate that you have had satisfactory credit since your economic event, your lender will review your credit report. All credit accounts will be scrutinized and your lender will check to see if; a) that you have displayed a responsible and trustworthy credit history prior to the economic event; that the bulk of derogatory credit occurred after or during the economic event; and, that you have re-established a consistent 12-month period of perfect payment history on major accounts. It is important to note that revolving accounts may have minor delinquencies. If you are still in Chapter 13 bankruptcy, you must have written permission from the Bankruptcy Court Trustee to enter into the mortgage. For help, call 877-432-LOAN (877-432-5626) or email info@fedhomeloan.org. The mortgage approval process is the same as any other FHA-insured mortgage. Click here to Apply! What Does Required Housing Counseling Mean? In order to qualify for this program, all applicants must agree to undergo housing counseling. This counseling is required by the Back to Work Program to address the cause of your economic event and to help prevent a similar event in the future. The housing counseling usually only lasts an hour and can also be done in person, by phone, or via the Internet. During this session, a counselor will talk with and provide advice to you regarding home buying, defaults, foreclosures and credit issues. The completion of the housing counseling does not necessarily mean that you have been approved for the FHA loan. You must still follow the FHA mortgage guidelines to be qualified.